As High Point’s only resident buyer’s agent I wanted to give a quick update – Spring is here, wow is it! There are so few resales on the market right now, and Polygon is selling it’s new homes right and left, 10 presold so far out of 83 total to be built. I couldn’t believe my eyes when I pulled a pending sales report. I have a sale pending also, but almost everything else is pending too! Maybe the real estate recovery has finally made it to Seattle. Report as of 2:15 am Saturday April 30. Some homes currently being marketed for sale require lender approval (short sale). Ask for details. Want to see a home for sale? Don’t have an agent? Call or text me at 206.280.5198. To be clear, as a Washington licensed real estate broker I represent all types of property, not just what is considered “green”. But to explain, this means I have countless hours or additional training to help people identify green real estate (healthy homes), which is especially valuable to those who have chemical sensitivities, asthma, or allergies. My designations include Earth Advantage® Broker, EcoBroker Certified®, and Built Green® Certified Professional: Real Estate Broker. When it comes to West Seattle, especially High Point, I am the healthy homes expert. And now we have brand new homes under construction on SW Graham Street by Polygon Homes. If you would like to follow the progress of these new homes on Facebook, there’s a public photo album on my Profile called New Green Homes in High Point that I update with my camera phone when out walking the dog. What makes High Point so great? Well, first of all, it is in West Seattle. I have lived in West Seattle since 1997. And I won’t leave. It has everything I need so I don’t actually have to leave at all, which is nice. And for when I do want to pop downtown for a night out, pick up someone at the airport, or go mall-hopping at Southcenter, all of that is within 15 minutes (using the West Seattleites travel tips, which I am happy to share). It was wonderful to have the opportunity to buy a brand new home in a Built Green Certified Community right in my own neighborhood. I had lived within a mile of this location for ten years, and watched the development of this community over that time with great interest. When I took a property tour in April 2007 I wasn’t looking for a new home and had no intention of moving – but what I found in High Point made me put my house on the market almost immediately, and the sale of our home on 18th Ave SW and the purchase of our townhome on SW Raymond all managed to squeek through right at the beginning of the real estate market fallout. We feel lucky that we managed to get moved and settled without any hassle.The utilities are underground so the views are not impeded by anything…but trees. And I like trees. The old trees in High Point were saved during redevelopment and they *make* this neighborhood. There are great views of downtown, sunrise, sunset, trails in the woods, access to Camp Long and the Longfellow Creek Legacy Trail all within walking distance.For the developer-identified benefits of living in High Point in West Seattle, check out these High Point Highlights. Call me. Or email me. Or send me a message on Facebook or Twitter. I know the Westside inside and out and can answer any questions you may have about what it is like living here. Just know you will get biased answers – because it is clear that I love it here!And check out my cool green lifestyle coaching page on Facebook, Westside Green Living with Wendy. Have a fabulous Spring! We’re installing a ceiling fan in our bedroom in anticipation of a hot summer. The listing links are only good for 30 days from the date of this post. A fabulous 4-star Built Green townhome is for sale in High Point (West Seattle). In this video I do a quick walk-thru tour. I live in High Point and am the only resident buyer’s agent in the community. Tonight is my night to record a podcast with Darryl Whelan, the owner of Healthy Painting, LLC. He has started a podcast called Healthy Homecast and is bringing in some great community speakers to educate listeners about how to create a healthier planet. I admit, I haven’t “prepared” for the interview. I know I will have no trouble talking for an hour about anything related to green and real estate. I met Darryl in 2008 when he came to one of my tours of High Point, the Built Green Certified community where I live in West Seattle. He had a lot of questions and we toured some of the homes (where admittedly he saw a lot of problems with how the painters had done their job). We talked for two hours straight as we walked around and I showed him the bioswales and other systems put into place to manage runoff in this 120 acre master planned community in West Seattle. I imagine the opening line of the interview being, “So, known for ‘being green and wearing pink’? Tell me about that,” and we will go from there! I’ll post a link after the show is produced. I hope to keep it exciting and informative! I don’t think it streams live. Be sure to check out my green lifestyle page on Facebook, Westside Green Living with Wendy. It’s a big week in the United States as we celebrate the 40th birthday of the Earth Day Movement. I appreciate that mainstream information sources like Realty Times are also providing information about green homes and living in a way that creates a lighter carbon footprint. Living a low-impact lifestyle means thinking twice about how your actions affect the health of the Earth. You may not believe that your everyday choices can make a difference, but you’re wrong. Making small changes in your own household is the best way to inspire bigger change. After an overnight rain in Seattle, you have an opportunity to see what a bioswale that was not built correctly looks like it and how it fails to fulfill its purpose. This is located in the High Point community of West Seattle. Wendy lives in this community and as a real estate broker specializes in West Seattle homes like the ones for sale in High Point. Just so you and your readers know, the High Point Open Space Association is aware that there are several swales in the community that are not working optimally. The developer is working with the original contractor to address these bioswales, and the work is scheduled to be done this Spring, once we have “drier weather”. Here’s hoping the sunshine is here to stay for a while, and soon these will be functioning as intended! I sold this home in 2007 – my husband and I bought it in 2001. We made some changes, and had a lot more to do. We decided to sell it and move to a environmentally-certified townhome instead since we weren’t really the “handy remodeler” types. It is back on the market and since I am a real estate broker and have a key I took the opportunity to go back in and take a look at the changes made by the person who bought it from me, and really appreciate the great appliance choices we had made. The new home we bought in 2007 came with Stainless Steel appliances so we left the white ones we had bought over time at the home where they were. I really really miss my Bosch dishwasher! If you like what you see and are interested in living on a very large lot in West Seattle, please contact me at wendyhj@greenspacesrealestate.com to arrange a showing. It has a great price tag on it since now it is REO (real estate owned) by a bank/lender. I am welcoming a new neighbor to High Point soon; one of my real estate clients is purchasing a townhome a couple of blocks from where I live in the Built Green Certified Community of High Point located in West Seattle. In this video I briefly speak to the benefits of townhome living (I am a previos self-described “townhome hater”) and how awesome those little square windows are. Did you know 19% of all US households have at least one member suffering from asthma? Indoor air quality is paramount to their health, not to mention the reduced out-of-pocket costs or Emergency Room visits also helps the whole family (1,800,000 ER visits annually due to asthma in our country). 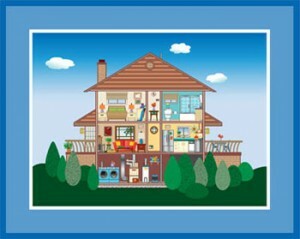 You should check out Care for Your Air: A Guide to Indoor Air Quality | Indoor Air Quality | US EPA. You can get a quick glimpse of some of the most important ways to protect the air in your home by touring the Indoor Air Quality (IAQ) House. Room-by-room, you’ll learn about the key pollutants and how to address them. Learn more about having a healthy home on the Indoor Air Quality page at the EPA website. 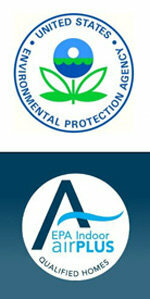 As an EcoBroker and Built Green Certified Professional I am trained to help you live a healthier life. I am happy to anwer questions no matter how small. Please drop me a line and ask me about homes with the Indoor airPLUS seal. There are probably a million “how to sell your home now” tip lists out there. But this one in today’s Realty Times has some good reminders for our modern times, specifying that “curb appeal” also means on the web. In a buyers’ market, selling your home can be a frustrating lesson, especially if you make costly mistakes that can slow your sales opportunities. I for one and am all for this. I moved to a community that is very walkable but it does not have a high WalkScore because it is a little too far away from the bulk of services a person needs. My dream is to move to South Lake Union, once it is built out, then I won’t even need to own a car.